THE DOMINICANS are at it again. Last Dec. 11, the Lord’s preaching hounds unleashed a force meant to further fire up an already splendid 800-year-old service to the Catholic faith when the Order’s Philippine Province premiered “Dominic: Light of the Church,” a full-length feature on the saint’s life and earthly exploits, at the Faculty of Medicine and Surgery Auditorium of the University of Santo Tomas. The film brings viewers back to late 12th century Spain, where the atmosphere reeks of war between Christians and Moors, famine, and, as a result, skewed Christian doctrines brought by Cathari (known more widely as the Albigensians, though historically this may be misleading) to any a person desperate for spiritual answers to the hardships of the time. It is against this background that Dominic is born in Caleruega in 1170, and it is in this same environment of blatant and widespread torment where he grows up, albeit in a well-to-do family, with a heart entirely for the suffering, and, as he grew learned in the Catholic faith, an unflinching eye against doctrinal inaccuracy. In going back, the film effectively rends its audience from the blithe present into the beginning of it all with the simplest and perhaps most effective teaching—and preaching!—method: a remembering, a return to the roots, so that one can gauge more ably where to move on. 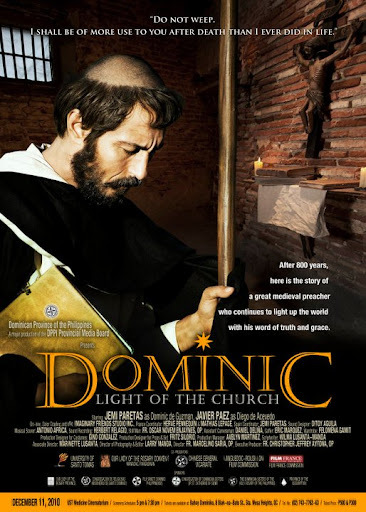 “Dominic” the movie embodies the attitude of remembering through the fictional character of Benito, a Dominican friar refreshing his thoughts with the memory of his late master, as if imbuing his walking staff with the needed sturdiness, and his mind with the needed wit, before resuming his travel to preach. The film project was the initiative of the Filipino Dominicans’ Provincial Media Board, headed by Fr. Jeffrey Aytona, OP. He said that the filmmakers first set out to do a documentary on St. Dominic. The scramble for locations, cast and crew, and a script, began in 2009. Fr. Melchor Saria, OP, served as film director. “We sourced the story mainly from the account of (Dominican historian Marie) Humbert Vicaire,” Father Saria said. The screenplay would be written by Wilma Lusanta-Manda. The success of the filming itself was attributed by the team to Divine Providence. The days allotted for principal filming and photography: 30. With a limited budget, the crew needed all the help they could get. Initial screen tests were done using audition videos sent only through Youtube. When the crew arrived in Spain, they were still making casting calls. They had not met some of the actors yet. The mayor of Calueruega was said to have made the rounds of the town, making calls. In all, there were 13 Filipinos, six French, and six Spaniards. There were two coordinators for France, and one for Spain—Spanish actor Jemi Paretas, who ended up in the title role. Translators came from the ranks of the cast themselves, solving the need for professional contextual translation. Even the nuns of the Prouillhe monastery, where a part of the filming took place, called on their patrons and families for help. Despite the odds, “Dominic” is not exactly an amateur production. The cast, script and locations lent themselves entirely to the execution of the film, giving it a genuine movie feel. “We filmed in the actual monasteries of Silos, Fanjeux and Prouillhe, among others,” Father Aytona said. Except for some over-extended scenes (Dominic’s self-flagellation, as well as the conversion of the Cathari innkeeper), the cinematography is fine. Panoramic shots of the Spanish and French countrysides come across impressively. cast’s heavy French and Spanish accents. The problem is somehow remedied by the English subtitling. The movie follows all the major points in the saint’s recorded life: from his refusal to use his bed as a child, to his education in Palencia where he notoriously sold his books for money he could give as alms to the poor, and his recruitment to the priesthood by Bishop Diego of Osma, and eventual ordination. Also shown are his reputed love for music; fondness for children; the impact of his eloquent teaching on his first convert from Catharism; and, most of all, his dogged devotion to fight heresy by going into the world himself, spreading true Roman Catholic doctrine. This last is highlighted by his extremely risky splitting of the then newborn Ordo Fratrum Praedicatorum (Order of Friar Preachers), assuring his fearful young brothers that this is the only way their preaching would reach all ends of the earth. This risk would eventually be vindicated by time. At the turn of the third millennium, the Order of Preachers had 6,000 friars; 4,000 contemplative nuns; 35,000 sisters in the apostolic life; and 80,000 lay members in around 60 countries. Far from stopping, the hounds of God (as the Dominicans have come to be known, a play on the Lord [“Domini”] and canine or dog [“canis”], as well as a reference to the vision of Dominic’s godmother during his baptism when she saw a star, or torch, on the baby’s forehead) continue their preaching in the new millennium, but with more modern evangelical tools. The powerful message of “Dominic: Light of the Church” is an uncomplicated one. It is the story of a man so venerated even in his lifetime, and yet so simple that he did not wish even the recognition given to far lesser men. His sole wish was to open everyone’s eyes to the truth in an eternal, one God, and by means that reached every single member of society. Remembering St. Dominic, pious and steadfast in his mission, might just help rouse people from today’s blind adherence to an ephemeral world. “Dominic: Light of the Church” is set to go on an international movie caravan starting January. Call the Provincial Media Board of the Dominican Province of the Philippines at 7437762-63.